A new initiative led by Lawrence Brown in our area means that less of the council’s money is being wasted on landfill charges. At the moment the council does not collect aluminium foil amongst various other things, which in most cases will end up in landfill. The new Green Party scheme hopes to divert as much as possible of that aluminium to recycling rather than landfill and save the Mayor and council tax payers money. Please get in touch if you can act as another collection point. Any money made from the recycling scheme will be given to local good causes. Lawrence Brown and Greens in Liverpool have been campaigning for 20mph zones on residential streets for several years and we are pleased that the council has begun to install these on some residential streets. However we think that the council could be doing more to make some main roads safer. Many people live on them as well as everyone who shops locally. Smithdown Road is one such main road which could be a much better place. It could be possible to have more space for pedestrians, and space for tables outside cafes. 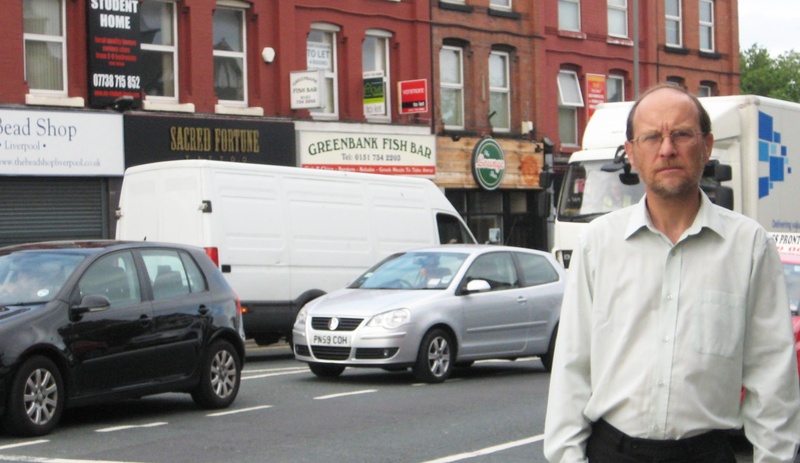 Lawrence Brown, is calling for the City Council to investigate ways in which Smithdown Road can be turned into a safer, calmer space with priority given to pedestrians rather than vehicles; without the use of road humps. If you have any views on this, please get in touch with Lawrence (details overleaf). We want to to put specific proposals to the City Council showing how the road can be improved and would be interested to hear any ideas from local residents.